Know a great place for Latitude? Headquartered in Australia, Latitude Entertainment designs, constructs and operates the world’s most exhilarating indoor aerial super parks. At Latitude you will experience the feeling of reaching new heights as you bounce, climb and fly and ultimately become an aerial superstar. Latitude’s Global Development Team is working with a number of talented organisations to bring the Latitude phenomenon to new markets and we are seeking partners who share our passion for creating a truly special facility. We have taken the indoor trampoline craze to the next level by integrating awesome climbing activities including clip on climbing walls, abseiling and obstacle course. 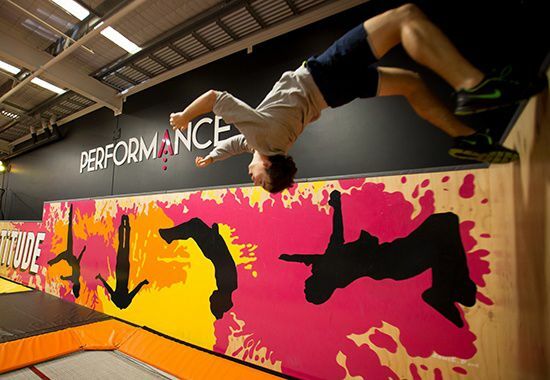 You can also stay airborne thanks to our 100 interconnected trampolines, a massive air bag, basketball lanes, dodgeball arena - there’s something for everyone and every age including under 5’s who have their very own Kids Zone. The Latitude business goes way behind the existing industry norms to create an out of this world sensory experience for everyone that visits our centres. An hour at Latitude is never enough! Latitude generates superior financial returns to our partners by virtue of our broad customer appeal from under 5’s through to adults. Our repeat customer rates are exceptional thanks to a combination of amazing activities, our energised staff and the quality of our facilities. We are flexible in our approach to partnerships whether they be straight license arrangements or equity joint ventures. What types of partnering options are there? What are the obligations of the licensee / partner? What are the centre build costs? What initial and ongoing support will be provided? Latitude will find the right solution for preferred partners in their chosen markets. Typically, this will be an exclusive license arrangement to a given region. We will also consider an equity joint venture. Latitude seeks partners capable of building 2+ centres in their market. Our partners are responsible for establishing the necessary local infrastructure to support centre build and ongoing operations including construction management, marketing, HR, finance and IT. You will be assisted by experienced Latitude staff along the way. Adherence to quality and safety standards is also paramount and the Latitude Development Team will guide the local management team via performance metric monitoring. Generally, there is an upfront payment for exclusivity to a country or region and then an ongoing royalty payment. Both the upfront fee and ongoing royalty will be determined with regards to the market size and opportunity. A typical Latitude Centre will cost circa USD$2-2.3M in Australia subject to size and building configuration. This includes design, construction, equipment provision, café, signage and all amenity. The total cost for offshore centres is subject to local labour and material cost. All activity equipment will be provided by Latitude. Latitude treats our partner centres as if they were our own and all of our combined resources will be available to support the construction, opening and ongoing operation of each centre to maximise its performance. We employ senior specialist resources to work alongside our partners from design right through centre opening and into general operational mode. Twice a year we will undertake structured performance optimisation sessions to ensure the business is achieving its goals and improvement opportunities are identified. Latitude will train the senior management team for 3-4 weeks at one of our key centres in Australia, or a centre closer to our client’s region. Our training team will then work locally for a period of time to support the on boarding and training of the general crew.